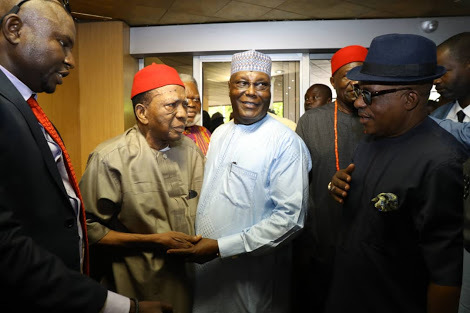 Presidential candidate of the People’s Democratic Party (PDP), Atiku Abubakar stormed the venue of the Igbo elders, religious and traditional rulers yesterday with other top politicians. He arrived in a large entourage that included the senate president, Bukola Saraki, Babangida Aliyu, Gbenga Daniel, Dino Melaye and other party chieftains. Atiku ‎told the Igbo leaders that he and Peter Obi would correct all the anomalies visited on Nigeria by the Buhari administration. He pointed at the security apparati in the country and decried the situation where most of the security chiefs were from one part of the country. “It aches ‎my heart when I receive texts listing the lopsided appointments of security chiefs. The appointments do not reflect federalism. This is not federalism,” he said. He promised to bring back to life the coal industry, regretting that coal which use to power the whole of Eastern Nigeria before the war was abandoned. He promised to give all it takes to make Nigeria a united and progressive country. “A combination of Peter Obi and I, you can trust will fix the economy," Atiku assured.